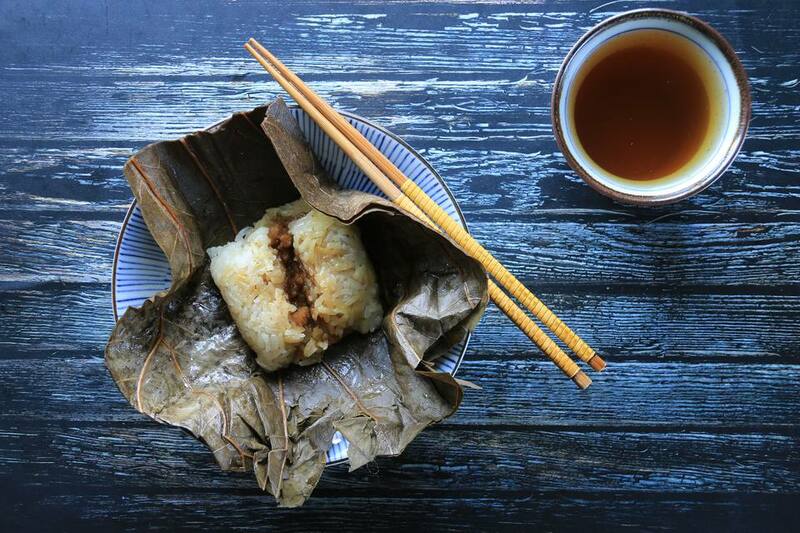 Lo Mai Gai (lotus leaf wraps) is a popular dim sum dish that is made by steaming lotus leaves filled with sticky rice, Chinese sausages, and other vegetables. One hour ahead of time, prepare the rice and lotus leaves. Soak the lotus leaves in hot water for 1 hour. Pat dry. Cover the rice with water and let soak for 1 hour. Drain. Next, steam the rice. Line a bamboo steamer with parchment paper or cabbage leaf. Fill a wok approximately to the halfway point with water so that the steamer will be sitting above the water without touching. Bring the water to a boil cover the rice and steam for about 20 minutes. Remove the rice, cover and keep warm while preparing the remainder of the ingredients. Soften the dried mushrooms by soaking in hot water for 20 to 30 minutes. Squeeze out any excess water, remove the stems and finely chop. Cut the chicken into small cubes about the size of a postage stamp. Add the salt, 1 tablespoon rice wine and 1 teaspoon cornstarch. Marinate the chicken for 20 minutes. Finely chop the sausages. Peel and chop the garlic. In a small bowl, combine the rice wine, light soy, and dark soy sauce. In a separate small bowl, dissolve the cornstarch in the water, and whisk into the sauce. Heat a wok and add 2 tablespoons oil. When the oil is hot, add the garlic and stir-fry until aromatic (about 30 seconds). Add the chicken cubes. Stir-fry until they turn white and are 80 percent cooked through. Add the sausages and the mushrooms. Stir-fry for a minute. Give the sauce mixture a quick re-stir then add in the middle, stirring quickly to thicken. Season with pepper to taste. Cook for 1 to 2 more minutes to mix everything together and heat through. Remove from the heat and stir in the sesame oil. Cool. To make the wraps, separate the rice and the filling into 8 equal sections, 1 section for each wrap. Lay a lotus leaf in front of you. Place a portion of the rice mixture into the center of a lotus leaf. Add the meat and vegetable mixture over top, shaping the rice with your hands so that it forms a ring around the filling. Add more rice to cover. Form a square parcel with the lotus leaf and tie it up with twine. Repeat with the remaining lotus leaves. Steam the lotus leaf parcels, covered, on a heatproof plate in a bamboo steamer for 15 minutes, or until they are done.